I went to Coggeshall in Essex on Thursday to spend a day in a primary school classroom, with Julie McCracken, who has introduced her 5, 6 and 7 year-olds to the joys of Clean Language. Julie and I are writing a book together on Clean in the Classroom, so I’ve heard many tales of clean goings-on, but this was the first chance I got to see for myself how the children responded to clean questions (they call them the ‘Detail Detective’ questions). It was an action-packed day, with children both asking and answering the questions. This post is about what happened in the gym lesson. Child 1: I liked A’s balance. Julie: Oh you liked her balance. And what kind of balance was that? Child 1: Straight and tall. Julie: And is there anything else about that balance? Child 1: Yes, her head wasn’t a bit wonky on its side. It was straight up. Julie then asked A to repeat her sequence, so that everyone could see what had been noticed. This way of doing things meant the praise was coming from another child rather than the teacher. Julie trusted that they had enough knowledge about gymnastics to be able to recognise a good move when they saw one. And by having the child show everyone the move again, they all got a chance to learn what a ‘good’ move looked like and to associate it with words like ‘straight and tall”. So they were learning from each other, rather from the ‘expert’. And since the children’s own words were used, there was also no chance of Julie using words that the children wouldn’t understand. Child 2: I liked B’s jump. Julie: What kind of jump was that? Child 2: She did it straight like a pencil jump. Child 3: I liked C’s forward roll. Julie: And you liked his forward roll. And is there anything else about that forward roll? Child 3: He did it in a kind of circle then went off and stood up at the end. Child 4: I thought D was very good because when she bounced on the bench she had her string on. Child 5: E was straight and at the right angle. Child 6: C's roll was a bit good. Julie: Is there anything else about a bit good? Child 6: She was doing it beautiful. Julie: What kind of beautiful? Child 7: If it was a bit good, what could she do to make it a bit gooder? Child 6: She could tuck her legs in. Julie: She could tuck her legs in. Again, Julie stayed clean, and after a few exchanges another child, who’d picked up on the assumption in the original statement that there was room for improvement, asked a clean-ish question in the spirit of enquiry to help the performer know how it could be improved. After this “clean interlude” in the lesson, Julie asked everyone to run through in their minds what they’d learned about really good moves and to see if they could incorporate it in their work. And off they went, striving to make the best moves they could in their sequences. 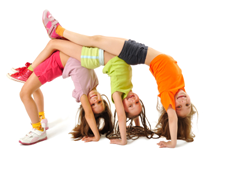 I am no expert in gymnastics but I could see a big improvement between the children’s first attempt and what they were doing by the end of the lesson. And Julie hadn’t given them a single instruction about how to move, or singled out any child as being a model to watch. They had done it all by themselves.